In the 15 years since Randy "The Flagman" Bartz first devised flags for decoying waterfowl, the idea and methods of using wing-like motion to attract geese and ducks into shotgun range have become a major part of waterfowl hunting. And although the concept of mounting an artificial set of fabric wings on stiff wire and sticking it onto a wooden dowel seems simple, using flags has become fairly sophisticated. "In the beginning, I told hunters to simply wave their flags up and down to simulate the image of a goose or duck flying up to and landing in some decoys or just stretching their wings or preening when they were on the ground," Bartz said. "Now after 15 years of experience, with thousands of waterfowl hunters using the flags in thousands of places, some new and very effective flagging techniques have evolved." Here are 10 flagging strategies devised by goose and duck hunters from all across the country. Be gross -- walk or run through your decoys while waving flags in an exaggerated, bigger-than-life motion to attract geese or ducks at a distance. 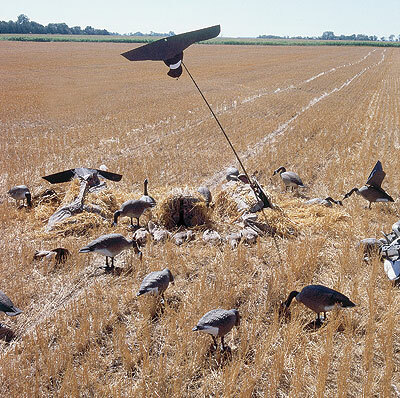 Gross-motion, waving flags in six-foot-wide arcs while the hunter walks or runs through a decoy spread, can get the attention of birds a mile or more away. Ducks and geese have keen eyesight and they are way up in the air, so they can detect motion from long distances. "Walking or running through your rig while waving a flag may at first seem a little ridiculous, but that funny feeling will soon disappear as soon as that first flock of honkers turns from pepper specks on the horizon to birds in your face," said Tim Grounds, a practitioner of walking/running-while-waving method of flagging. When geese and ducks get close, be subtle with flagging movements. Stop flagging just before you pick up your gun to shoot. But when birds are close, make sure you finesse your flagging. Reduce the motion to just minor flutters, characteristic of waterfowl walking on the ground or feeding. Reduced motion is important because it can bring birds directly over the guns for up-close shots. Geese and ducks look for activity on the ground when they are ready to land, so convincing flag movement will help birds finish. It can keep birds from landing short or swinging to the far side of the spread. Whether you are well concealed in a goose pit, totally camouflaged in a duck boat, shooting from an A-frame field blind or lying on the ground among decoys, you can use the flag as a shield for your face. You can still peek at the birds to read their progress, and then adjust for more calling, flagging or to shoot. "Being able to see incoming game is always important and part of the thrill of hunting," Bartz said. "Hiding behind a flag will let you see what's going on and still keep you ready for action." Flags can be used even when the spread includes other motion decoys -- bags, windsocks, flying decoys, kites, full-body motion kits, moving shells, silhouette decoys and even spinning-wing devices. Flags act a complementary decoy spread enhancers, and often serve to pull geese and ducks close enough so they see the other types of motion devices hunters have deployed. However, flags have a distinct advantage over other motion devices. Because they are hand-operated, no wind or battery-powered motors are necessary. They don't wear out, even after many years of active use in a wide range of conditions. Some waterfowl hunters have found that geese and ducks can be drawn to just the sight of flags in motion out in a feeding, resting or roosting area. Pass-shooters have coaxed geese and ducks over fencelines, brush piles and other hiding places by merely waving a flag while calling. Obviously, making the birds finish is difficult, but they can be pulled within range by the motion and sound. If nothing else, waving a flag might reposition the flight line of the flock on its way from a roost to a feeding field. Don't blow your lungs out when waterfowl are too far upwind to hear a goose or duck call. Instead, use flags as a visual hail call instead to get the attention of long-range birds. On days when birds are passing upwind out of earshot or when you are running traffic fields, flagging might turn birds that won't hear your calling or might commit quickly to another field. "Most serious waterfowl hunters and all of the professional guides I know use flags to augment and sometimes replace calling," according to Fred Zink, an international goose calling champion. "There are many days in the field under certain circumstances when flags have more influence than calling." Even though geese or ducks have seen the flag and look like they won't come into the decoy rig, don't give up until they are gone. "Many times I've watched geese slide on by my set as if they didn't see it. But we keep on working the flags, then, at the last minute, the birds will turn and come right on in, sometimes flying back a mile or more just to get there," Bartz said. Even when geese or ducks have been spooked by something in the decoy rig, keep at it. The motion of the flags can sometimes overcome an initial negative reaction. Similarly, resume waving flags after shooting into the flock. Sometimes, especially with early-season geese, flagging will bring them right back around for another pass. Although flagging is mainly associated with field hunting for geese, don't forget about ducks. The same attention-grabbing qualities that draw geese attract ducks, too. Hungry mallards and pintails often mix right in with geese in crop fields, so waving a goose flag is a perfectly natural enticer for ducks. A few companies that market goose flags have also developed duck flags. Recently, the use of large black flags in layout boats positioned in diver and sea duck decoy spreads has gained popularity. Bluebills, redheads and scoters all respond to flagging motion that emulates landing birds in open water. Unlike flagging for puddle ducks or geese in a field, stop flagging divers as soon as you have their attention. Let your decoys do the finishing work. If one flag is good, two can sometimes be better. One hunter can easily manipulate two flags at a time with one in each hand for twice the motion effect. Or, two flags can be mounted on one pole to simulate the image of two geese or ducks flying or landing together. To really bring a field to life, several hunters can wave multiple flags to create the illusion that a larger flock is landing. Of course, when the birds get close, tone it down to just a couple flags flapping gently. As with calling, practice can make a difference when it comes to flagging motion. Take your flag to place geese and ducks congregate, such as parks, golf courses, refuges or small lakes where you can observe birds. Watch the mannerisms of live birds, and then duplicate it with the flags. You will discover important, helpful details about the wing motions ducks and geese make while landing, walking and swimming. Jerry Thoms is a long-time WILDFOWL contributor from Brookings, S.D.